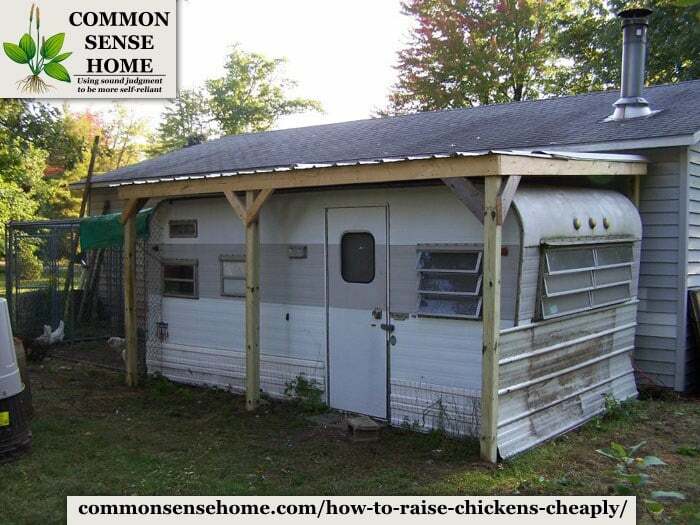 You are here: Home / Homesteading / How to Raise Chickens Cheaply – Small Budget? No Problem. That's what I needed to figure out. I got the idea to raise chickens while unemployed for several months. Times got a little tight (to say the least!) and I thought that if I had a coop and a garden at least my family and I would have just a little more in the pantry. So I set out to learn as much as I could before spending any little cash. Here are a few lessons learned….. I was lucky enough to have a local feed mill sell my eggs for me – but it's hit-and-miss some months. During the winter, egg production drops like a rock but feed consumption goes up. During the summer, feed consumption goes down but egg production goes up. You will either have so many eggs that you just can't get rid of them, or so few any steady customers you do have will not get eggs year round. It’s just part of raising chickens! I also leave a red light on inside the coop 24/7 to help keep down incidents of picking. Chickens get “Cabin Fever” just like we do in the winter so give them something to do. Scratch blocks in the coop work well, as does enclosing the run in plastic sheeting so they can still get out side even on cold snowy days. Throw in a head of cabbage once a week or a bale of hay into the run so they can pick it apart during the winter. This is a guest post by my friend, CJ Harrington, who is busy building his homestead with his lovely wife up in northern Wisconsin. Originally published 7/14/2012, updated 12/29/15. Very informative and easy to understand! thanks! Thanks, Garilyn. Glad you enjoyed it. My family and I live in the middle of the city and were able to build our chicken coop completely out of salvaged wood from off the side of the road- the only cost was for the chicken wire. It is so much fun having chickens! We have 11 and are yet to find out how many roosters/hens we have (we know we have at least one rooster that we’re going to eat) and the hens are due to start laying in about a month. I’m so excited to finally have fresh, delicious eggs! Becca – that’s great! 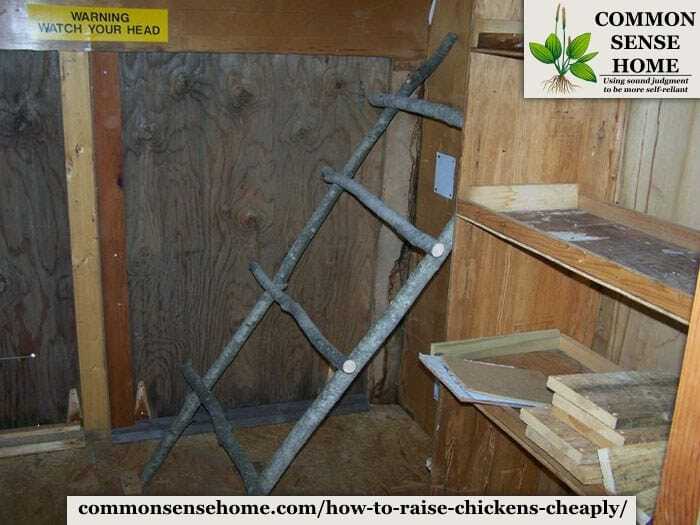 It’s always interesting to hear how people have come up with creative solutions for chicken housing. Enjoy your birds! Excellent post, CJ! I love how you repurposed the old camper and outfitted it for your crew! Thanks! Like I said, money was tight…besides, it was a good way to recycle! Hi, very informative, I bought my first baby chickens in March 2012. They were about 6 weeks old, bought fancy feathered feet chickens. I had bad luck, did not know what I was doing, had them in a pen, without a top. It took about 2 weeks for some kind of critter to get 10 in one night! Needless to say a big lesson learned. Had a top the next night, still have the four left from that batch. Added 4 bantam hens and 3 bantam roosters. In May I added 9 more Fancy Feathered Feet chickens, had one bantam hen set, now raising 7 babies, now another hen went on the nest last Wednesday. I now have 29 chickens total. My have I had lots of fun with them growing up. The bantam babies will take food from the big chickens and run. My heart doctor told to to raise me some chickens and a garden, and that is what I am doing. I have not had any chickens in 52 years, I have learned a lot the last few months. Sorry you lost some of your chicks, but glad you are enjoying the rest. Myra, my Doctor told me that I should reduce stress. Although the chickens and garden are some work, I feel the is NOTHING more relaxing! I have only 5 chickens and I am a newbie, but I love my girls and find them fun to watch. They have their coop and a run, but not been able to let them run free until I fence the yard, They are not laying yet, but soon. Your post is very helpful, thank you. I try every helpful idea I find to make the girls happy, healthy and safe..
We use cheap feeding by sprouting grains which is all natural and costs 1/10 th to feed them. Sprouts are good for us because they are nutrient dense and they are great for the birds -filled with chlorophyll and all the nutrients needed. We found info on MyBackAchers.com the sprouting book. Thanks for the tip, Sherry! Sprouts are great for people and critters, plus, I bet the chickens would find them entertaining, too. Excellent advice. I’ve raised cattle, but chickens, no experience whatsoever. After reading this, I know I could. Thanks. It’s ALOT easier then cattle! If your chickens have ever laid an egg, you’ll know they’re not silent!! They have a call to announce an egg. My mom (who lives in suburbia, but just outside of of city limits) has never had a rooster for long, but used to get accused of it all the time, just because of how noisy her girls got. Careful feeding grass clippings – make sure they’re short! If they’re long, your chickens will get impacted crops. Not fun. Have you thought about raising JUMBO COTURNIX QUAIL? Check out info on the internet, I got interested in them when trying to find a way t to off set my chicken expenses. LOL! 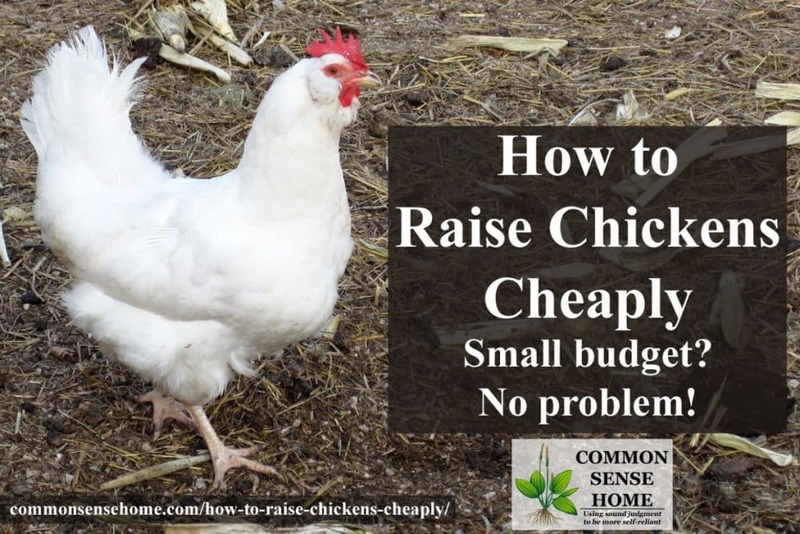 Chickens are ALOT easier to raise then cattle!….and eat less as well! This is excellent advise! Would love to have you share this on my very first blog hop. How do I go about sharing? Shoot me an e-mail at Bronc6@hotmail.com please! I don’t own chickens (yet) but I wonder….would it be financially smart to butcher the chickens each fall so that you’re not feeding them all winter, and then get new chicks early enough each spring so that they’re laying by the time your hens (that you butchered) would’ve started laying again? Seems like this might be the best of both worlds. You’d get eggs, you’d get meat, and you wouldn’t be feeding chickens all winter with no return. What do you think? Jamie – egg production doesn’t stop entirely during winter, it only slows down. While I haven’t made a detailed economic comparison, slaughtering the birds in fall seems like you’re really unnecessarily cutting short the productive life of the chicken. That’s only a few months of eggs per bird. When my mother’s mother used to raise large flocks of layers (she had a big barn with over 100 birds), she would rotate out the previous years layers when the current birds started laying, not before. Grandma lived through the Depression and was very frugal, so I’m guessing she watched the numbers closely and that was what made the most financial sense for her. @ Jamie… chickens take about 12 weeks to start laying. If you butcher them each fall, then like was stated before, you would be cutting short the life of a productive bird. Wintering over a flock isn’t much work and the feed costs aren’t extreme. I would think that it would cost more feeding a flock for 12 weeks, getting up to laying age, then feeding year round due to the fact that you start out chickens on a “starter” blend of feed which costs more. Besides, while you are feeding your “new” flock for 12 weeks, you aren’t getting ANY eggs. If you choose the right breed, wintering over is not a problem…. What is food grade DE and where do you get it? Can you use just the sand and wood ashes? Also how often do you need to give chickens grit? Thanks for your very interesting blog. We have 6 chickens. 2 blonde, 2 redheads & 2 freckled and they are about 1 1/2 years old, they run free most days, we keep a light on at night. We have are not getting the egg production this year that we got last fall and erly spring, is there something can provide them to encourage them to lay? As chickens get older, they will naturally lay less. At that point most people I know turn them into soup, and if they’ve planned correctly, have a fresh flock to replace them. My grandmother used to raise huge laying flocks (100+ birds) and replace them annually. Most breeds are “in their prime” for about 2 years. After that, egg production drops. Now, this time of year, it could be the weather. Keep the light on for them. I give mine a handful of scratch grains in the evening. It helps them keep up their body heat during the night as they digest it. Also, try giving them some type of greens. I will put a bale of hay (not straw) in their run and let them pick it apart of throw a head of cabbage in the coop once a week. They will benefit from the extra protein. If nothing works, just let them be…they will lay. Weather is a BIG factor for me in the cold North. Sometimes I have days with no eggs at all! One thing or two to improve chickens egg laying is to provide clean clear water for them and to feed them certain grains and seeds for minerals and protein. Certain vegetables for vitamins they need. I make my own chicken feed for my 20 or more free range chickens. It is cheaper and healthier than the processed factory made is. I mix 50 lb. bags of barley, wheat, rye, oats together ( $10-$12 each) that I get from our local feed store. Then I add as big of a bag that I can get of black oiled sunflower seeds($6-$10) found in the garden area and a container of flax seed ($14) if you can afford it, found in the grocery area from Wall Mart. They share a 1 lb. (16 oz) of my mix a day. My hens layed eggs almost every day from spring until fall. They slowed down in the winter but started early the next spring. Pumpkins are a great way of giving them their vitamins to be healthy and strong. My son came home with a small pumpkin from school one day in the fall so I saved the seeds and mix them into a empty garden bed. The seeds had the rest of fall to germinate and for the roots to grow all winter long. So by early spring I saw lots of pumpkin plants starting to grow a beautiful pumpkin patch. I also saved some of the black oiled sun flower seeds and grew them to. You can also sprout or fodder the different grains during winter for greens. Maybe you can grow the healthy herbs and flowers they love. You can find the list of those from others on Pinterest. I wouldn’t rule out selling eggs. I have 16 sweet hens (Rhode Island Reds) and can’t keep up with the demand at $3/dozen. We keep the money in a box and use it to buy food and bedding. It must depend on where you live. Egg prices are region specific. I sell my Leghorn eggs for $1.50 a doz. Some areas get ALOT better prices! In the part about making them dust, you say a part DE, I am assuming that you dont mean a part of Delaware (where I live…lol) what does that mean? Also, we are wanting to start this spring, how many chicks would you recommend? I was thinking 2 or 3 females and 1 male? DE would be diatomaceous earth. If space is limited, you really don’t need a male to get eggs. How many eggs would you like, and how much room do you have? 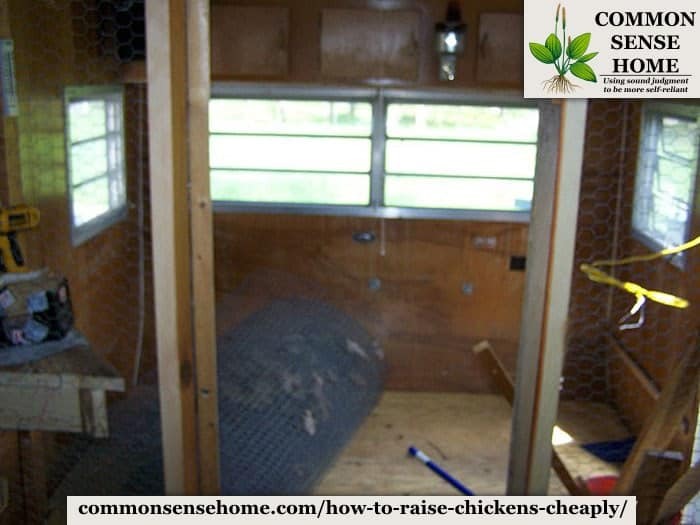 love your coop setup… yes chickens are economical they will eat scraps etc. I bought 5 when I started & never looked back, my coop was made on the cheap from pallets & I made a cheap incubator, raise my own & usually butcher the rooster surplus, & sell off a few of my chicks. I have reduced my grocery bill eating a lot of creative egg dishes, & chicken is abundant. Mix that with a bit of in season garden & you eat well. The cost to keep is balanced by the reduction in the grocery bill, and the savings is also in the gas not needing to run to town as often when you produce a portion of your food. I couldn’t agree more! Also, homegrown chicken meat is better for your health! If you give them some artificial light (fluorescent) in the coop or even use some solar lights (that you line paths with) out in the run, your egg production will increase during winter. That way, your feed will be ‘more justified’, as you will still be getting enough eggs to warrant the cost of feed. Just a thought! CJ your blog is very informative thankyou for sharing these tips. During winter, I usually give my “gurlz’ corn in the evening, corn is something they can digest at night time and it keeps them warm the whole night. You can also try hanging a cabbage on a string inside the coop. These will keep them busy as they toy around and peck on the cabbage as well. Winter can become so boring at some point, thhe cabbage will make them happy. Make sure also that you have enough space for the chicken to roost. During winter they love fluffing their wings because it is a way to keep them warm. So on point with egg production and the inability to sell them. I have had similar issues trying to keep up with demand or finding the buyers and the girls stop laying. We lost over 100 birds this year to predators – hawks and raccoons mainly. It’s been rough. This has been a great info on starting to keep chickens. I plan to set up my coop and its surrounding yard this winter. By Spring I hope to be set to purchase my chicks. Still not sure which variety to go with. Best wishes. I was wondering why people but baby chicks instead of six month old. Don’t they start laying eggs around six or nine months? I’m fixing my pin and coop now and getting ready to buy some chickens for the first time, but I’m wondering what age is best. I’ll probably be able to buy some in January and I live in Lubbock Texas where it’s rarely in the teens in winter. It is usually in the forties and fifties during the day. I want to get them so that by the time they reach laying age it will be spring and they will lay at full capacity. Hope that makes sense. Chickens can fly over short fences, so if that’s a concern, you should add a roof. If you have airborne predators, like chicken hawks, add a roof. You may want to allow chickens in the garden before planting or after harvest for cleanup duties, but I wouldn’t put them in during the growing season because they dig and peck and generally are pretty destructive. There may be zoning restrictions that require you to keep your chickens caged. If not, please check with your neighbors and make sure it’s okay with them if the chickens wander a bit. (See prior mention of chickens being destructive.) I know I would be very upset if neighbor’s chickens trashed my flower or vegetable beds. Thanks for such a useful post! Plenty of cutsie, fluff articles out there. Not near enough real life ones such as yours though! You’re welcome. I think that there are more and more folks who are learning to do more on a smaller budget. This is some great information, and I appreciate your point that taking care of chickens isn’t difficult. My kids have been wanting some sort of pet for a while now, and my husband and I want to get something that is easy to take care of at first. We’ll definitely look into getting a few chickens to start out, and we’ll be sure they are taken care of. Thanks for the great post! Hi my hen laid her first egg three days ago. Then she just stopped, its been three days now. Is this normal or should i expect eggs soon. I’m not sure. Unless she shows signs of stress, be patient. She’s just getting started out. Thank you, thank you and more thank yous to you, Sir CJ & Miss Laurie!! This article really cemented my desire to start a small poultry business back in the Philippines when the time we’ll settle there for good. I have a 700 m² idle lot back in our province and I think that’s more than enough space for a small backyard farming. 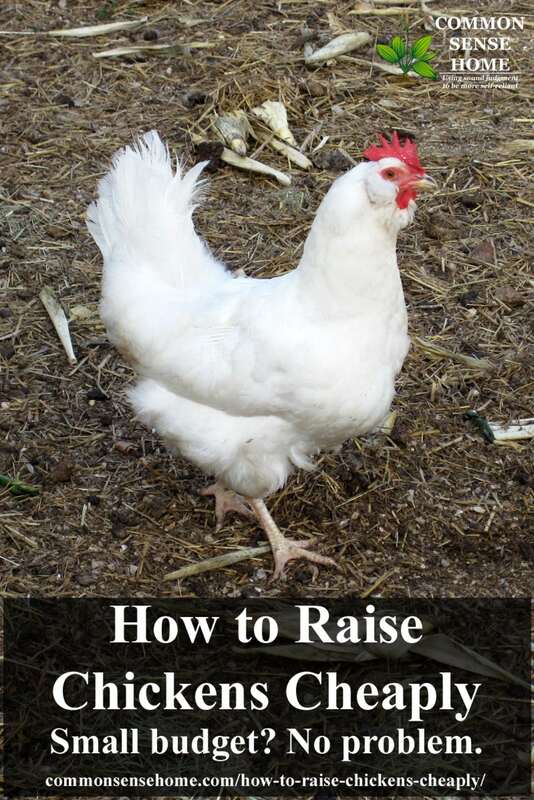 This article AND ALL the comments in here gave me tips on how to do the chicken raising and all the bad things that might happen during the raising. Now, I am bookmarking your site so I can go back and read again if I miss some things. Again, my kisses to all of you!! You’re welcome, Sunshine, and best of luck to you. My biggest challeng is to expand my poultry business,the bank is not offering the best i need….what should i do? Expand slowly, as you can afford. Too many farms go into huge debt that they can never repay by expanding too quickly. Ask around for materials that may be salvaged to provide shelter, but always put the health of your birds first. Avian flu is becoming more common, and stressed birds are more likely to get sick. The birch ladder is really really epic my dear, so orginal and so useful ! I`ll start crafting it this weekend if I manage to convince my hubby ! The article is informative and has given me a drive to introduce the habit of keeping chicks. I only face the problem of little space and the conditining for Dar es salaam is warmer than that of your place. I like your story it does give me an idea of what I’am planing to do. I’am planing to have a farm to feed chicken and sell eggs in the erea where I live and need more ideas. I’am interested to hear from other people how they look after their own farm and especially how to take care the chicken to lay nice eggs so that I can sell them for my income.